If you've gone scuba diving before, then you know the allure of exploring the undiscovered, underwater world. This combo course lets you do that in the enchanting Andaman Sea, while teaching you the basic and advanced skills of scuba diving. Throughout the course, you'll complete nine open water dives, eventually going down to a depth of 100 feet in the Andaman Sea. Before these dives, you'll study the theory of scuba diving in a classroom and practice your skills in a swimming pool. Throughout the course, you'll be trained by a certified dive instructor. NOTE: You'll be required to pass a 650 feet swimming test and 10 minute floating test before beginning this scuba diving course in Andamans. 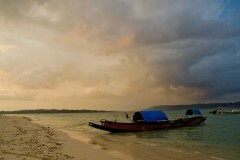 Havelock Island is a 2-hour ferry ride away from Port Blair, in the middle of the Andaman Sea. Your dive center is located on Beach #3 at Havelock Island. 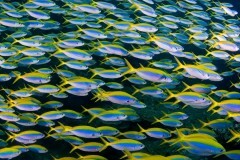 The ocean around the island is home to some of the highest counts of fish and coral species on the planet. Apart from a number of spectacular dive sites, you will also find white sand beaches, swaying coconut trees, and a relaxed island vibe in Havelock. It's the perfect spot to spend a week to learn scuba diving and earn your certification of PADI Open Water Diver and PADI Advanced Open Water Diver. • Book the combo course of PADI Open Water Diver and PADI Advanced Open Water Diver. • Explore tropical reefs, gorgeous landscapes and spot hundreds of fishes. 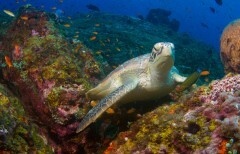 • Choose from night diving, wreck diving, deep diving, and more elective dives. • Learn scuba diving in small groups with personalized attention. If travellers are unable to complete the requirements that are mandatory to obtain certification, an intermediary certification or referral form can be issued, at the discretion of the dive center. For cancellations made 30 days or more before scheduled start-date of this Andamans scuba diving course: 100% refund. For cancellations made 29-15 days before scheduled start-date of this Andamans scuba diving course: 50% refund. For cancellations made less than 15 days before scheduled start-date of this Andamans scuba diving course: no refund. All refunds will be processed after deducting a transaction of INR 200 per person. This fee is charged by The Great Next. Travellers are required to pass a 650 feet swimming test and 10 minute floating test before beginning this scuba diving course in Andamans. Travellers are required to complete a medical questionnaire, sent after confirmation of the booking. Based on answers to the questionnaire, documented clearance from a doctor will be required to enrol in this scuba diving course in Andamans. Travellers must agree to discontinue scuba diving if respiratory congestion, a head cold or any other medical condition occurs during this scuba diving course in Andamans. The tour operator reserves the right to alter or cancel the itinerary of this scuba diving course in Andamans due to bad weather conditions to ensure maximum safety of divers and staff. Report to the dive center by early morning. Here, you'll complete the paperwork, meet your dive instructor and begin training for the first section of your combo course - the PADI Open Water Diver course. During the day, you'll study theory modules, water videos and take short quizzes to understand the basic principles of scuba diving. You'll also dive into the swimming pool at the dive center to try out your various scuba skills and get comfortable with the scuba equipment. The day's session ends by late afternoon. You can spend the rest of the day at leisure. You'll follow the same itinerary as yesterday: arrive at the dive center, study theory modules and watch videos, work with your dive instructor during pool training. You'll continue learning different aspects of scuba diving, such as the proper way to breath underwater and the various ways of navigating underwater. The day's session ends by late afternoon. You can spend the rest of the day at leisure. Day 3 of the PADI Open Water course: 2 open water dives! After two days of classroom and pool training, you'll be confident enough to go diving in the open sea. You'll head out into the Andaman Sea to complete two open water dives, swimming down to a maximum depth of 40 feet. During each dive, you'll practice and demonstrate your knowledge of scuba skills picked up during the previous two days. The day's session ends by late afternoon. You can spend the rest of the day at leisure. Day 4 of the PADI Open Water course: 2 open water dives! Today, you'll complete two more open water dives, swimming down to a maximum depth of 60 feet, to earn your PADI Open Water Diver certification. During each dive, you'll work with your dive instructor to put the finishing touches on your basic skills of scuba diving. After the dives, you'll have a short quiz at the dive center, before completing the paperwork for your PADI Open Water Diver certification. The day's session ends by late afternoon. You can spend the rest of the day at leisure. Day 5 of the PADI Advanced Open Water course: 3 open water dives! Arrive at the dive center and begin the second section of your combo course - the PADI Advanced Open Water Diver certification. 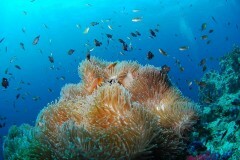 You'll head out into the Andaman Sea to complete three open water dives, swimming down to a maximum depth of 100 feet. During each dive, your dive instructor will teach you specialized skills of deep diving and underwater navigation. The training will continue during the boat rides between dive spots. The day's session ends by late afternoon. You can spend the rest of the day at leisure. Day 6 of the PADI Advanced Open Water course: 2 open water dives! Today, you'll complete two more open water dives, swimming down to a maximum depth of 100 feet, to earn your PADI Advanced Open Water Diver certification. Before the dives you're required to select one of the electives dives offered by the dive center such as naturalist, wreck, buoyancy and more. During each dive, your dive instructor will teach you specialized skills of your selected elective. The training will continue during the boat rides between dive spots. After the dives, you'll have a short quiz at the dive center, before completing the paperwork for your PADI Advanced Open Water Diver certification. The day's session ends by late afternoon. Your trip ends here. Personal expenses like meals and beverages etc.